Frontpage › Forum › People & Places of Wolverhampton › Lindy Lou – Now Bereft. This topic contains 1 reply, has 1 voice, and was last updated by Billy 4 years, 2 months ago. There can be no doubt as to identify this Inn site. Tunwall Street is the ancient name for Victoria Street, and Johns Lane most of which is now absorbed in to the Mander Centre. I have placed this photo especially for Ray a new member from Dorsett, an ex Wulfrunian formerley from Whitmore Reans. 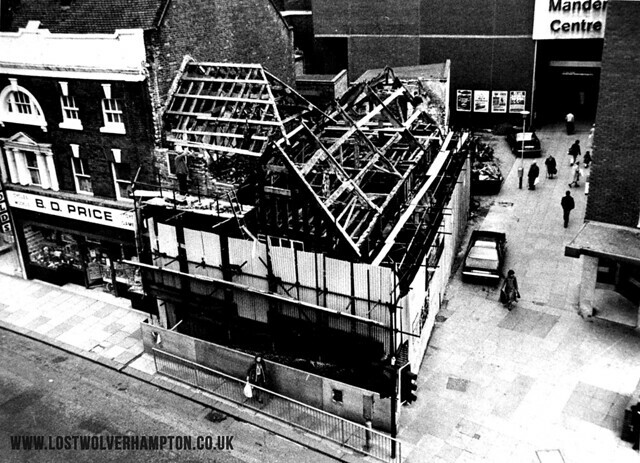 Ray said he once worked on Lindy Lou’s shop in Victoria Street and I am assuming it was at a time The Building was going through these drastic changes , which for me was – A transplant to far!. Not many Old Wulfrunians left now, who can say they enjoyed a restful break in the Old Copper Kettle.